This documentation pages give you detailed information about all parts of JacpFX, how to bootstrap a new JacpFX application and the general usage. You may want to read the quick-start tutorial to start with a JacpFX project. Like any other UI application framework JacpFX has a hierarchic component-structure to create client applications. an ApplicationLauncher, which contains any configuration to bootstrap the application as well as the application main method. a Workbench, the root Node of the client application. It contains the Perspectives and application specific configurations. UI Fragments to define parts of your UI. This allows you to split the Component-view in more fine-grained managed controls. Stateful/Stateless service Components, non UI service-Components for task execution and communication with external systems. JacpFX projects have a typical maven project structure. An ApplicationLauncher contains the main method, the component-scanning configuration, the managed container configuration and a reference to the workbench class. The "getXMLConfig()" methods returns the name of your spring configuration xml, which is located in the resources folder. This is an example for the usage of the „minimal launcher“ without any other dependencies. Returns the defined Workbench class. Define all packages to scan for Components and Perspectives. JacpFX uses component scanning to resolve all Components and Perspectives by ID. This method gives you access to the JavaFX stage. You may define a stylesheet for your application. The Workbench is the root node of your client project. It provides a simple interface to configure the basic behavior of your client. Besides the application launcher, it is the only component where you can get direct access to the JavaFX "stage". Furthermore a Workbench logically groups all Perspectives defined by @Workbench annotations. To declare references to Perspectives, simply add the Perspective ID's to the "perspectives" attribute of "@Workbench" annotations. The component-scanning tries to find the corresponding Perspective implementation in the classpath. The Implementations do not need to be located in the same project as the workbench as long they are in the classpath. A FXPerspective defines the basic UI structure for your view and provides a container for Components. While a FXPerspective is more like a template with placeholders (or a portal page), Components are the detail views of your application (or the portlets). A typical UI application has a root node and a large tree of Nodes/Controls which represent the application UI. The leaf nodes of such a component tree are your user defined controls like Buttons, TextFields and so on. A Perspective allows you to register JavaFX Nodes of your FXPerspective view, where Component views are rendered. Child Components in your FXPerspective can now registers themselves to be rendered in one of those targets. The "handlePerspective" method must be overwritten and will be executed on each message the FXPerspective is receiving. @OnShow: A method annotated with @OnShow will be executed when an active Perspective gets the focus. Only one FXPerspective is visible in a workbench at the same time. When a FXPerspective gets a message it gets the focus and is placed to the foreground. @OnHide: A method annotated with @OnHide will be executed when an active FXPerspective loses the focus and is moved to the background. FXPerspective can be implemented either programmatically in plain JavaFX or declarative with an FXML view. Programmatic FXPerspectives declare their view in plain JavaFX. You can create any complex UI tree but you have to register the root Node of your UI tree which will then be added to the workbench. Declarative FXPerspectives provides their view by defining a FXML file representing the view. The root Node is always the root of your FXML and is automatically registered. Component references are defined inside the @Perspective annotation. Once the application is started you can move Components from one Perspective to another. Components are subjected to one simple rule: They are ALWAYS unique per Perspective. You can't add the same Component twice in one FXPerspective, but you can use one Component in many FXPerspectives. The same Component will be created in its own instance per FXPerspective. Render targets are areas in your FXPerspective where Component views are rendered. You may register any Node of your FXPerspective view to be a render target. A child Component of your FXPerspective can now register itself to be rendered in this node. active (optional): The State of the Perspective. The default value is "true". If the value is set to "false" the perspective will be activated when it receives the first message. viewLocation (optional): The path to the FXML file. If this attribute is set the FXPerspective will be handled as a declarative Perspective. resourceBundleLocation (optional): The path to your resource bundle. localeID (optional): The default locale, if not set the system default will be used. While FXPerspectives help you to structure your application, Components are more like "micro" applications or portlets. You can simply create master-detail views and reuse Components in different FXPerspectives. Basically JacpFX Components are distinguished in UI and NonUI Components; UI Components may contain your complex UI (e.g Form) and Controls like "TextField" or "Button". NonUI Components are meant to be services for long running tasks or a connector to an external system. Common to all Componentsis that they have a “handle” method. That method will be run outside the FX application thread so the execution does not block the rest of your UI. UI Components must implement the "FXComponent" interface. They act as controller class and return a view either in plain JavaFX or FXML. 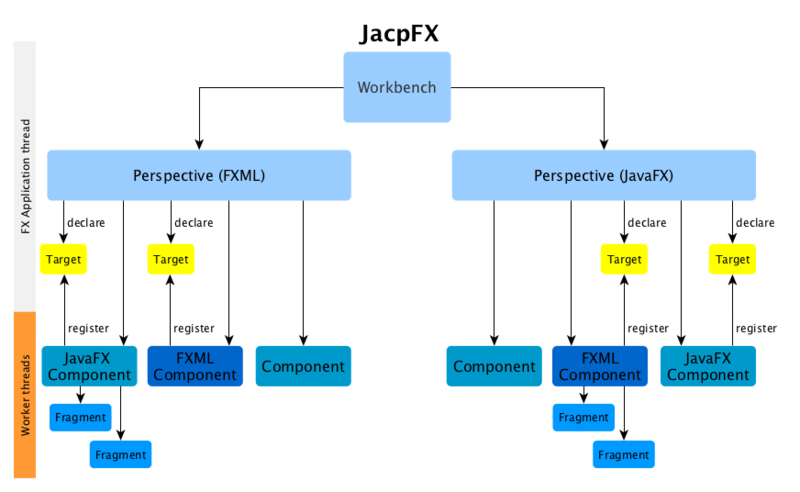 While JavaFX Components must return a (JavaFX) Node, FXML-Components pass the root node of their FXML view directly to the parent FXPerspective. The "handle(...)" method is executed first each time the FXComponent receives a message. This method will be executed outside the FX Application Thread an worker-thread. 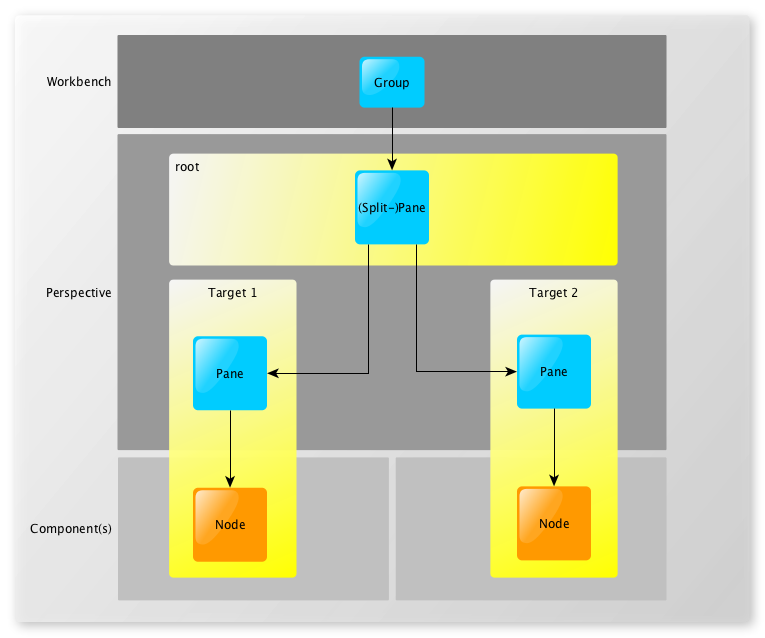 The return value of this method is a JavaFX Node which will be passed to the FX Application thread from the "postHandle" method. Unless you not modify existing UI elements you are free to create any new UI elements. You can use the handle method to create large and complex UI trees, but you should avoid modifications of existing Nodes (it will throw an UnsupportedOperationException exception). You are also free to return a null value and to create the View-element in the postHandle method. The "postHandle(...)" will be executed on the FX Application Thread after the "handle" method is finished. In this method you can modify any existing View Node. In case of FXML Components you should not return any Node (it will throw an UnsupportedOperationException). The associated FXML document is the Node that is passed to the target from the corresponding FXPerspective. @PostConstruct: A method annotated with @PostConstruct will be executed when a FXComponent is activated. Usually this happens on start and before the "handle" method. @PostConstruct is executed in the FX Application Thread. The method signature may have no parameter, an FXComponentLayout parameter and/or a reference to the ResourceBundle. With the FXComponentLayout reference you can define Menu and ToolBar entries in your FXComponent. @PreDestroy: A method annotated with @PreDestroy will be executed when a FXComponent is destroyed. The method will be executed inside the FX Application Thread. The method signature may have no parameters, the FXComponentLayout parameter and/or the reference to the ResourceBundle. FXComponent may be written either programmatically in plain JavaFX or declarative, with an FXML view. The @View annotation contains all metadata related to a JacpFX-Component implementing the FXComponent interface. "active", defines the initial FXComponent state. Inactive FXComponent are activated on message. "initialTargetLayoutId", contains the render target id defined in the parent FXPerspective. The "postHandle" method of a FXComponent must always return a JavaFX Node representing the view of the JacpFX-Component. The @DeclarativeView annotation contains all metadata related to the FXML-Component implementing the FXComponent interface. The "postHandle" method of a FXML FXComponent must return NULL, as the root node of the FXML-file will be passed to the FXPerspective. Callback Components are service like Components which react on messages and returns an Object to the caller Component or any other target (Request/Response). By default the caller Component will be notified unless no return value is specified. The "handle(...)" method will be executed each time the Component receives a message. 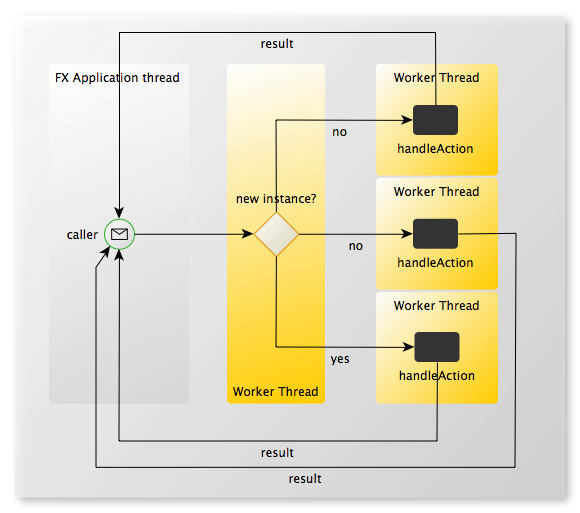 This method will be executed outside the FX Application Thread inside a worker thread. By default the return value of this method will generate a message to the caller Component to return the result. If no return value is specified, no result message will be sent. If the return value should be redirected to another Component you can use "Context.setReturnTarget("parent.targetId")" to specify the target Component. @PostConstruct: A method annotated with @PostConstruct will be executed when a Component is activated, and runs in a worker Thread. The method signature may have no parameter and/or the reference to the ResourceBundle resourceBundle. @PreDestroy: A method annotated with @PreDestroy will be executed before a Component is be destroyed. The method will be executed in a worker Thread. The method signature may have no parameter and/or the reference to the ResourceBundle. The @Component annotation contains all metadata related to the Callback-Component implementing the CallbackComponent interface. "active", defines the initial Component state. Inactive Components are activated on message. A stateless CallbackComponent must implement the CallbackComponent interface and define the annotations @Component and @Stateless. Stateless Components are using instance-pooling for scaling, a CallbackComponent pool will be created for every Component per Perspective. JacpFX Fragments are small managed Components, that exist in the context of a FXPerspective or a FXComponent. The purpose of a Fragment is to create a reusable custom control or a group of controls that has access to the parent context. This allows the Fragment to send messages, access resources and to interact with the parent FXComponent or FXPerspective. A Fragment can either extent a JavaFX "Node" or declare a FXML view. The Fragment itself cannot be a message target, but his parent FXComponent can access his Controller class and the view. The @Fragment annotation contains all metadata related to the JacpFX Fragment. "scope", defines the scope of the Fragment (singleton/prototype). Fragments can either extend a JavaFX Node, or be a POJO defining a FXML view. Fragments never instantiated directly, they can only be created inside a FXPerspective or an FXComponent. To create a Fragment, the Context interface provides the method: getManagedFragmentHandler(FragmentOne.class); and returns a ManagedFragmentHandler. The Handler provides access to the controller (FragmentOne) and to the view (VBox). Depending on the Fragment scope, the method call returns always the same instance or in case of "prototype" scope, different one. The ManagedFragmentHandler holds the reference to the Fragment instance and their view. To create a Fragment, the JacpFX Context interface provides the method: getManagedFragmentHandler(FragmentOne.class); and returns a ManagedFragmentHandler. The Handler provides access to the controller (FragmentOne) and to the view (VBox). "getController()" returns the instance of your Fragment. "getFragmentNode()" returns an JavaFX Node representing the view. Messaging is an essential part of JacpFX that allows to communicate with all FXPerspectives/JacpFX Components, and to change their state. You can send an object to any components and start their specific lifecycle. The JacpFX Context provides methods to send messages to other Components and to the caller itself. "send(M message)", sends any Object to the caller component itself. The target and the source id is equal in this case. You may use this method to trigger asynchronous execution in the "handle(...)" method of your Component. JacpFX has a hierarchical Component schema where a Workbench is the root node and Components are the leaf nodes. 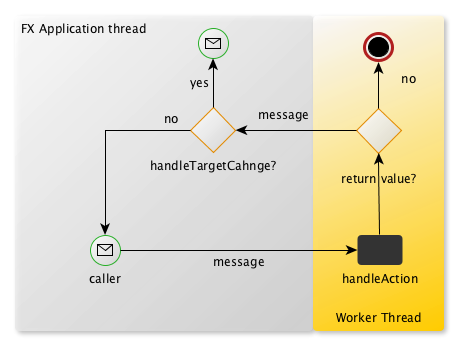 The Workbench can never be a message target itself but you may send messages from a FXWorkbench to any Perspective/Component. JacpFX has a simple "." (dot) separator to specify the exact target of your message. only valid for JacpFX Components; defines the parent Perspective by id. You may move Components from one Perspective to another. only valid for FXComponents; set a valid render target defined by the parent Perspective. You may move a Component view from one area in your view to another. @Component, @DeclarativeView, @View and @Perspective annotation allow the declaration of a resource bundle and a default localeID. If no localeID is declared the system default is assumed. Set the relative resourceBundleLocation in URL (in resource) like "bundles.languageBundle" and create in resources/bundles a file languageBundle_en.properties for further informations on resource bundles see: http://docs.oracle.com/javase/7/docs/api/java/util/ResourceBundle.html. To get access to the ResourceBundle use a @PostConstruct annotated method with a ResourceBundle parameter or annotate a class member of type ResourceBundle with @Resource. Dependency injection is provided by the Launcher implementation which is currently is Spring. All Perspectives and Components are Spring managed beans and supports all injection capabilities of a Spring bean. An error handler catches all Exceptions occur in an JacpFX application and forwards it to an error dialog. JacpFX comes with a default implementation, but you may want to overwrite it with your own implementation. To do so you need to extend the AErrorDialogHandler and to implement an error dialog. The ErrorDialog must extend an JavaFX Node and should handle/display the StackTrace or an appropriate error message. To register the dialogHandler overwrite the getErrorHandler() method in the application launcher. JacpFX provides a default optionpane, which can be displayed as a modal dialog. To create an optionpane, you can use the createOptionPane method of the JACPDialogUtil. While the title and the message will be taken as parameter of the create method, you can set the Eventhandlers for all four buttons individually. Every button has its own “setOnAction” method. Showing and hiding the optionpane is managed by the JACPModalDialog. To show a dialog you have to provide a Node, that should be displayed (e.g. JACPOptionPane or a Custom Node). Call hideModalMessage() will hide the dialog, which is currently shown. The JACPOptionPane comes with a default theme, which can be overridden using a custom stylesheet. Every part of the pane has a corresponding css-class. Attention: The message part uses the JavaFX Text class. So ensure to use -fx-fill to apply a color to the message text. All other parts will use -fx-text-fill. With a custom stylesheet, using the mentioned classes, you’re able to style the option pane to your specific needs. All Buttons will be added within a given context, which means, the toolbar knows which button belongs to which perspective, component or workbench. This allows the toolbar to show and hide your buttons as needed (eg. switching to another perspective). To manage the buttons by yourself, you can add buttons by providing an id. If you do so, the toolbar will not handle those buttons, which means, they will not disappear if you switch perspectives. To manage the context by yourself, all methods are also available with a second parameter (String id). The end portion of a toolbar will be the right hand side, if the toolbar has a horizontal orientation, or the bottom end, if the toolbar is oriented vertically. Added nodes on the toolbar, can be removed by using the remove method. For self-managed buttons, you can also remove buttons for a given id. The JACPMenuBar is registered to the Workbench. It is an extended MenuBar, which will take custom nodes, windowbuttons, and (of course) MenuItems. Just setup your menu within the postHandle-method of your workspace. Basically the menubar will work, as known from the JavaFXmenuBar, for adding MenuItems. Windowbuttons (minimize, resize, close) have to be registered if needed. The Buttons will only show up, if the Stage is set to UNDECORATED. For MAC OS X users: Hence to the option of using the system-menu on the very top of the screen, the stage will always be DECORATED, thus the buttons will never show up. Using the addNode(final JACPMenuBarButtonOrientation orientation, final Node... node) method, you can add custom nodes to the menubar, either on the left- or right hand side. Since the JACPMenuBar uses a JavaFX MenuBar , for holding MenuItems , you can use the std. MenuBar classes for styling. The windowbuttons, are styled by using a set of classes and ids. Styles Windowbuttons can look like this. The additional part (ContentPane) will hover above the UI. If you click on the button, the ContentPane shows up and disappears if a click outside the Hovermenu is detected. For the Hovermenu the ContentPane is a plain JavaFX - Pane, which allows you to add about anything to it. The JACPOptionButton is based on a Hovermenu. It will take a single or a series of buttons, which are added to the ContentPane. The behavior is the same as known from the hovermenu. If the main button is clicked, the ContentPane and the Buttons are shown. The ContentPane will be hidden, if a click outside the ContentPane is detected. For a OptionButton, you can decide if the ContentPane will also disappear if a Button of the ContentPane is clicked. If you want that to happen, just set the hideOnAction parameter of the constructor to true. The @Resource annotation can be applied to a member to get the reference to the JacpFX Context or the resource bundle.